BenQ launches three new home cinema projectors | What Hi-Fi? The W600, W1000 and W6000 are the three in question, offering a cheaper portable 720p unit, an affordable Full HD projector and a £2499 option for more serious punters. 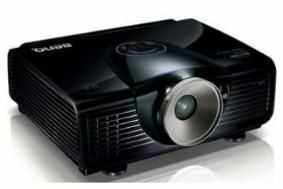 The W600 has a 1280 x 720 resolution, 2200 ANSI lumens brightness, a 3000:1 contrast ratio and 1.53-1.76 throw ratio. Out soon, it's yours for £499. That brightness level should hopefully mean the projector is much more confident when operating in bright rooms during the day than the average projector. Moving on to the W1000, and for £999 you'll get a 1920 x 1080 resolution, two HDMI inputs, ISF-calibration, 3000:1 contrast ratio and 2000 lumens brightness. The 'luxury' choice is the W6000 (pictured), weighing in at £2499 and offering the same Full HD resolution and choice of inputs, plus zoom and lens shift options for easy calibration. Both the W600 and W1000 should be out on November 1st, while the W6000 should be out any day now.